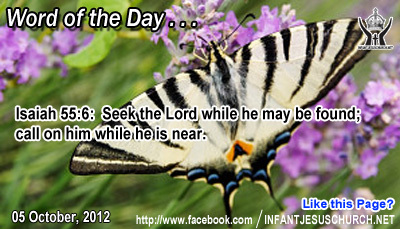 Isaiah 55:6: Seek the Lord while he may be found; call on him while he is near. Heavenly Father, we seek you Lord with all our heart. While we seek to know about you through your Word, we long to know you and be known by you as a loving father knows his child and as a child feels complete trust toward his loving father. Father, not only be our God, but also be real to us in ways that transcend explanation. Help us to sense your nearness and to know your presence. In the name of Infant Jesus we pray. Amen. Wherever Jesus went he did powerful works to show the people how much God had for them. Chorazin and Bethsaida had been sacred with the visitation of God. They heard the good news and knowledgeable the wonderful works which Jesus did for them. Why was Jesus disappointed with these communities? The word woe is also interpreted as alas. It is as much as an expression of unhappy disappointment as it is of anger. Why does Jesus weep for and issue a stern warning? The people who heard the gospel here very likely responded with unresponsiveness. Jesus upbraids them for doing not anything! Repentance demands change – a change of heart and way of life. God's word is life-giving and it saves us from devastation – the ruin of soul as well as body. Jesus' anger is heading for toward sin and all which hinders us from doing the will of God and receiving his blessing. In love he calls each one us to walk in his way of truth and freedom, grace and mercy, justice and sanctity. Do we receive his word with faith and submission or with doubt and indifference?